My mind runs at a pace well over 100 mph. Ideas, to-do lists, daily worries; all seek my attention. At times it becomes too much, so I would grab my camera, take a short drive. I would go to a place nearby and would explore. Even though I been to these places many times, I would see new things, or the same things, differently. I would be in the moment, a Zen like state. It took a stroke to discover the benefits of mindfulness. As part of my therapy, I would meditate, slowing the world around me. Looking at a star or a planet in the sky, focused on the singularity, reaching a mindful state. I realized that I was being Mindfulness when I separated from all the mental noise and focused on my destination, with my camera. If you’ve taken a photography class, you learned about aperture, shutter speed, ISO and other technical aspects of photography. You aim your camera and your mind thinks about the settings, the mechanics of the shot. Worse, you might see imperfections in the composition or you wish you had a different lens or a better camera. In Mindfulness, this is called a mindless state. This can easily overshadow your creativity. Ideally, you see the photo with your eye and intuitively, aim your camera and shoot. A pro golfer knows where he wants to ball to land, gets himself in position and swings. The mechanics of his shot is instinctual. Separating yourself from your mindless state can be challenging at first. A technique that I am trying: take a daily walk through your neighborhood, taking one picture a day. Don’t judge, but also don’t necessarily shoot the first picture you see. If you practice meditation, do so before you pick up your camera. I take a walk every day, along the same route. I take my iPhone and when my eye sees a picture, I consider whether I am willing to take it, because I only can take one. If I take the shot, no regrets, the iPhone goes in my pocket for the duration of my walk. The previous example takes discipline and I don’t recommend this for your vacation. However, it illustrates a good practice of slowing down, think about the image you see, before moving the camera into position. When your eye sees something of interest, your instinct is to aim and shoot. I suggest taking a moment, and visualize your subject or the object. Be mindful of the image, before you depress the shutter button. It’s normal for your eyes to see something of interest, and instinctively aim your camera and shoot. Often, you may experience tunnel vision, only seeing the object that first caught your attention in the picture. You could be missing a better shot, or a distracting element you only discover when you look over your pictures later. Consider various angles, the lighting and background. Get yourself in a mindful state, let your eyes become the camera lens; experience the image before you depress the shutter button. In my next article, I will further discuss mindfulness in photography and visualizing techniques, for more creative photography. NYC has a wonderful and innovative park running from Chelsea to West 34th street, along the old NYC Central Railroad spur, the High Line Park. This elevated park, thirty feet above the street, offers excellent people, art, flowers and architectural photography. The High Line is approximately 1.5 miles, providing glimpses of different neighborhoods and views of the city. The High Line opened in 2009, with the latest segment (the third) to West 34th street, opening in 2014. Originally in an industrial area, now it is among the most desirable locations to live and work in the city. Spend a few hours and then descent into the city, from one of the a many access points, to explore and dine. One of our favorite destinations is the vast and diverse Chelsea Market. We offer a photography workshop at the High Line a few times a year. Come along with us or explore this ever changing park on your own. Waterfalls are truly one of the most serene subjects to photograph. The sounds of the water cascading against the rocks create a calm inspirational mindset. Don’t rush when in this zen-moment, as you set up your tripod and compose your creative photograph. At times like this, take the time to enjoy nature and the moment. Let the sounds and sights flow through you - inspire you. In Waterfall Photography Part I, we discussed camera accessories that you will need to take beautiful and effective waterfall photographs. In Part II, we will provide insights into different exposures that will help you to take your own creative waterfall photographs. Plus we will provide some insights into composition, so your pictures will be unique and interesting - inspiring. Before we begin to discuss exposure, you should have some knowledge of the following technical concepts: shutter priority settings, exposure compensation and basic rule of thirds composition. The links will take you to a web page where you can get more information on these concepts. Our subject is moving, therefore we would suggest using Shutter Priority (or manual) mode. And because you are using a tripod (or should be), select a low ISO 100 or 200. We suggest setting up your composition to encompass the overall scene, the water fall and the flowing river. Then for your next set of pictures, we recommend exploring the falls close up. Look for bright contrasty vegetation or sharp rocks near the rushing water; look for the falls within the falls. What shutter speed should you use? Each waterfall and river runs are different speeds, faster after a big rain storm or snow melt – slower during the heat of Summer. Take pictures at different shutter speeds and determine which looks best when you view them on your computer. You won't really be able to tell which image has the wow factor in the small back-of-camera screen. We recommend speeds between 1-5 seconds (1”-5”) and up to 1/15th of a second. Sometimes you can get pleasing results at 1/30 and 1/60th as well. Examine the example below of the same scene photographed at different shutter speeds. This is where your Neutral density filter will be helpful, allowing you to shoot slow speeds (long exposure) on a bright sunny day. Be sure to check your picture to verify the exposure (not too bright/washed out or dark). Adjusting your "exposure compensation" may help to dial in the best exposure (for those using shutter priority). These concepts also work when taking photographs of a flowing river. Look for vegetation and in the Fall, bright colored leaves that may be in the water. If you are on Facebook, visit the waterfalls facebook page and share you inspiring photographs. View recent images from our NJ Photography Workshop at Bushkill Falls (Flickr). Winter snow melt creates fast moving rivers, producing dramatic waterfalls along its journey to the sea. As a photographer, who can resist taking inspiring waterfall photographs? For me, I enjoy sitting nearby and listening to the sounds of water cascading over and across the rocks. How do you see a waterfall in your photographer’s minds-eye? Do you capture the water drops crashing against the rocks, or enjoy the smooth silky water flows taken with a long shutter speed? Do you take in the whole natural scene, or focus in close, capturing each individual drama of the falling water against rock? In this edition of Technical Corner, we will discuss the equipment you need to take beautiful and exciting waterfall photographs. In Part II, we will discuss how to view a waterfall, how to explore and discover the intricate drama beyond the overall scene. A sturdy tripod is imperative for capturing waterfalls using slow shutter speeds (any shutter speed less than 1/15th of a second, and more so when at multiple seconds). We suggest that your choice of tripod be based on weight and convenience, yet sturdy. Many waterfalls require a walk or hike from the parking area, so a tripod that retracts to a smaller size and one that is light will be benefit. Visit a local camera store to find the one that fits your price range (support your local camera shop when you can). If you don't have a tripod, find a bench or flat rock to steady your camera. When using a slow shutter speed, it is important to keep your camera steady to prevent your image from being “shaky”. A remote shutter release allows the camera shutter to be activated without physically touching the camera. The release can be connected to your camera though a short wire, or via wireless. We do not suggest the infrared wireless, which requires line of sight. Wireless allows you more freedom to be further from your camera (often up to 150’). A typical wire shutter release is $20. Wireless can be similarly priced with some offering the ability to release the shutter from your iPhone/Android device. If you do not have a shutter release, you can use the cameras self timer. Lastly, be sure to have a Neutral Density (ND) filter for each lens you plan to use for your waterfall photography. This is an invaluable filter for creating the silky time exposures that effectively conveys the waters motion. On a bright sunny day, even at your lowest ISO setting (100 for instance), the slowest shutter speed that may be usable is 1/125 or 1/60th. A slower speed and your photos begin to look washed out – too much light is entering your camera. And at these speeds, you are more likely to freeeze the individual water drops – then to get the real motion you are seeking. The solution – the neutral density filter - inhibits light coming into your camera, allowing the use of slower shutter speeds. These filters come in different sizes (width) for each lens – and in different degrees of “light reduction”. Typically an ND 2 (also expressed as 0.3) blocks ‘1’ stop. ND 4 (.6) blocks 2 stops – an ND 8 (.9) blocks 3 stops – all the way to an ND 256 ( 2.4) blocks 8 stops. There are also variable ND filters, which are more convenient – allowing for a range of light resistance of (typically) 1-5 stops. In a pinch, a Polarizer Filter will block approximately 2 stops. We suggest a minimum of ND8/ND10 for the most effectiveness. Click for more information on using ND filters. Alternatively, visit the waterfall on a cloudy day, which naturally produces less light on your subject. Exploring waterfalls are a great way to enjoy photography and get outside. In our next article, the first in a series on “Composition and Seeing, Expanding your Digital Vision”, we will discuss how to look at a waterfall in ways you might not have considered. And we will also discuss other creative uses of the Neutral Density filter. NJ Photography Workshop and Classes: Join us Saturday, April 21 10am at Bushkill Falls exploring eight amazing waterfalls on a easy to walk trail. Sign up today, since class size is limited. One of the trickiest aspects of photography is shooting in low light situations. How do you take creative and beautiful photographs in museums, concerts, gymnasiums, restaurants or other places where you don't have (or don't want) a tripod and using a flash is not permitted? Let's me introduce you to the "ISO Escalator" technique. To my knowledge, this is a term that I coined a a few years ago when I began to teach students how to leverage ISO to handle low light photography. If you want to learn more about ISO in general, review ISO Settings in Digital Photography, Digital Photography School. One note on using Flash in low light situations. Don't! Flash kills the mood, may not be permitted and will annoy everyone around you. Also, please turn off Auto ISO. The concept for the ISO Escalator is to determine the slowest shutter speed that you need for your shots, and yet be fast enough to avoid shaky/blurring pictures. Then determine what the best ISO to use, based on a room or space that is perhaps the darkest situation you plan to shoot at. Imagine being in restaurant with just the ambient lights, turned low for a nice mood. That is most likely your average or worst case lighting. In a Gallery or a Museum, one of the rooms where there may not be ambient light from outside windows. Once you determine the correct ISO, you should be able to shoot in the space (and adjoining rooms) without thinking about anything but your composition. In our workshops, we teach that it is important to keep photography fun. This technique allows you to have fun, while knowing your photos are likely to come out looking nice, without the typical blur-shakiness we have all experienced. This is an example of using the ISO Escalator in a reptile room at a Zoo. 1) Set your camera mode to Shutter Priority (S for Nikon, Tv for Canon). This mode allows you to set the shutter speed, while allowing the camera's metering system to select the best aperture. You are (hopefully) aware that Aperture Priority (A for Nikon / Av for Canon), allows you to set the aperture, while your camera sets a corresponding shutter speed. 2) Determine the slowest or best shutter speed for your photography. If you are using a light weight lens, such as a 55mm or the 18-55 kit lens, and you subject is not moving, you could shoot at 1/60th of second. This is ideal for museums or restaurants. If you are shooting action, such as an energetic rock band or a sporting event, you may need to be shooting at 1/125 or 1/250 (or more). In other words, set the shutter speed to the slowest speed to match your subject. Even for most sports, you rarely will need to exceed 1/500th of a second. Note on minimum shutter speeds and lenses: Vibration Reduction (Image Stabilization - VR/IS) aside, the rule of thumb for determining the slowest speed for any lens is the reciprocal of the lens focal length (mm). Simply put, if you are using a 200mm lens, your slowest shutter should be around 1/200, 400mm =1/400th. VR/IS allows you to shoot a few stops (slower shutter speeds) - but I like to suggest following this rule if you are new to DSLR photography. 3) Set your ISO to 400 and take a test photo. Examine the photo and if it is dark, set your ISO to 800 (use the full ISO numbers ie 200/400/800/1600....). Take the same photo - and repeat until you have a nicely lite picture. Don't go to high with your ISO - don't lose the mood. In the example above in the reptile room. I was using a 200mm lens, so I set my shutter to 1/200th - and worked my way up the escalator (now you know why I call it the ISO Escalator). At 3200, the subject looked well lite. I went one more stop (ISO 6400) and thought it was too bright, so I reset my ISO back to 1600 - and focused on composing pictures in this darkened room. Recap: Try it yourself in your dining room or other interior space, with the lights dimmed. Set your ISO to 400 and take a test photo. If the image is dark, change to the next ISO and repeat. Once you have the right ISO - wander around your house taking photos, not thinking about ISO or shutter speed. Fun right? Let me know if this simple technique has helped you to improve your low light photography. Place yourself inside a room, with lights on low, with beautiful bright sunshine streaming through the windows. Look around the room, and notice that your eyes adjust to the changing light seamlessly, from the shadows and dark interior to the bright scenes outdoors. You probably never thought about this, why would you? Until you tried to take a photo, and the windows were washed out, or the interior was pitch dark. This range of light - dark to bright - is called Dynamic Range. The human eye is truly amazing in many ways, including the ability to see across a high dynamic range of light. Cameras cannot replicate this, so we use a concept called HDR (High Dynamic Range) photography. The concept is simple - take three photos of the subject, varying the exposure for each shot. Take the first image, based on the proper exposure, then the next one increasing the light (to make the dark areas brighter) - and the third photo exposed for the outdoors or bright areas. In this way, you have exposed for the interior of the room, the exterior view and a middle range. Then using software, such as Lightroom, combine the three images into one. Like magic, the bright areas and the dark areas are well exposed in your new image. In this example, we photographed the inside of an abandoned train in Lambertville NJ (The Graffiti Train), with bright outdoor light and the darker interior. Another great place to use HDR photography is inside a large church or cathedral, with beautiful stain glass windows lite brightly from the outside. Using HDR, your photo will expose the interior and the windows correctly. Without HDR, your photo will be dark with beautiful windows, or well exposed interior and bright washed out stained glass windows. Click Photo, them Photo Merge. Lightroom will combine the images for preview. Deghost (usually set to None), eliminates people (or objects) that are in different locations within your three images, such as a person walking. If the preview looks good, click MERGE. The final photo will have _HDR appended to the filename. Tips that you can use to create your own creative HDR images. Tripod: Use a Tripod or Monopod, if you can, or try and shoot all three photos without change the composition. Shutter: Select Manual Mode so that you can change the shutter speed, not the aperture, so that depth of field is not effective. Alternatively, use Aperture Priority, and change your exposure compensation (+- button). IPhone Photographers, download the VividHDR app (you will thank me!). RAW: there is a technique where you can create an HDR like image, from a single photo, but it has to be shot in RAW. Real Estate Photography: Some photographers use HDR for real estate images, to properly expose the interior and the views through the windows. River Town Photography teaches HDR in our DSLR and iPhone classes, and in our Lightroom workshop. How times have changed for the professional Realtor. In New Jersey, we had the green books published a few times a month with all the latest listings and beautiful (sarcasm) small black/white photographs. It is cliche to say the internet has changed the industry, with the addition of multiple listing services sites, Realtor.com, Zillow and others. Add in social media, and the visibility of your client's home has magnified 1000 fold - and so has your marketing efforts. In a previous post, we discussed the importance of professional photography as part of your marketing mix and to enhance your own brand. We propose to bring professional photography together with social media to add another channel - to help caste a wider net. We believe that there are three "online" focal points needed for a consistently successful business and a strong brand. Great photography, strong compelling content describing the property and a way to amplify your voice to the people you want to attract. Naturally, there are other factors offline that make you a great realtor. River Town Photography, LLC announces our new "Social Media Extended Reach Program tm. Reach is a measure of the audience that views your post, your content on social media. This is a critical success measurement in terms of social media results. Sales funnel 101; the more of the right people (the demographics of your likely buyers and clients) that views the listing, the more likely you will have a ready, willing and able buyer. In addition, when potential sellers see your marketing acumen, they are more likely want you to represent their property as their listing agent. The Social Media Extended Reach Program tm is available to River Town Photography clients for free, or for a slight fee for non-photography service clients. The program begins with the images, where we add content within the image (invisible to the viewer) - called meta tags. Meta tags are content that is visible to the search engines. We insert your name, your agency name, the property address, and your website. We include other important keywords, such as 4 bedroom colonial, 3 car garage, large acreage, views of the Delaware River, and other keywords that are relevant for the property. We extend the reach of your listing by posting 3-5 images on Pinterest, within our branded board (NJ & Pa. Homes for Sale). Pinterest is highly searchable by Google and Bing, and the demographics is well into the sweet spot of real estate buyers (42% women*, 34% with income over $75K, 55% 30-64 age group). and Instagram; NJ PA Homes. Maximum exposure, complimenting your own marketing strategy! The real estate business is highly competitive and the best of the best are more likely to be ahead of the curve when it comes to marketing and promotion. The objective of our Social Media Extended Reach program is to greatly enhance your property marketing and your own brand building. Call or email us to learn more about this innovative program along with our professional grade photography services. email: [email protected] (973) 615-5287. Photography by Stephen Harris is moving to Lambertville NJ. Lambertville and New Hope Pa are two very creative oriented small towns linked by a bridge over the Delaware River. This will truelly be an adventure re-establishing our photography services business in this beautiful location. Lambertville has some wonderful festivals including Shadfest. For a change it will be nice to walk to the festival and not have to drive around seeking parking. In fact, it will be nice to be in a town where everything is walking distance from home. Speaking of home, ours features a separate building which will be perfect for a portrait and product studio - even a photography classroom. That is, once all the extra boxes and furniture are moved out of this space. More on our services in New Hope Pa and Lambertville NJ (and surrounding area) over time. For now, it will painting, cleaning and moving in time. Are you ready for a challenge? If all your photography has been the digital variety, this might be a difficult challenge – but I promise you it will improve your technique and composition skills. Imagine if you could no longer view the image on the back of your camera. Further, you cannot view your photos until hours later. Before you click the shutter button, you have to pay close attention to the exposure and composition. While composing your photo, you check and double check for distractions and ensure your subject is in the best possible position. Then – and only then – you click the shutter. And you only have ‘36’ pictures in your camera. Welcome to the 36 Exposure Challenge. When I began my photography adventure, my camera was completely manual. There were no ISO (ASA at the time) controls, no auto focus and no auto white balance. Metering was with a hand held meter. 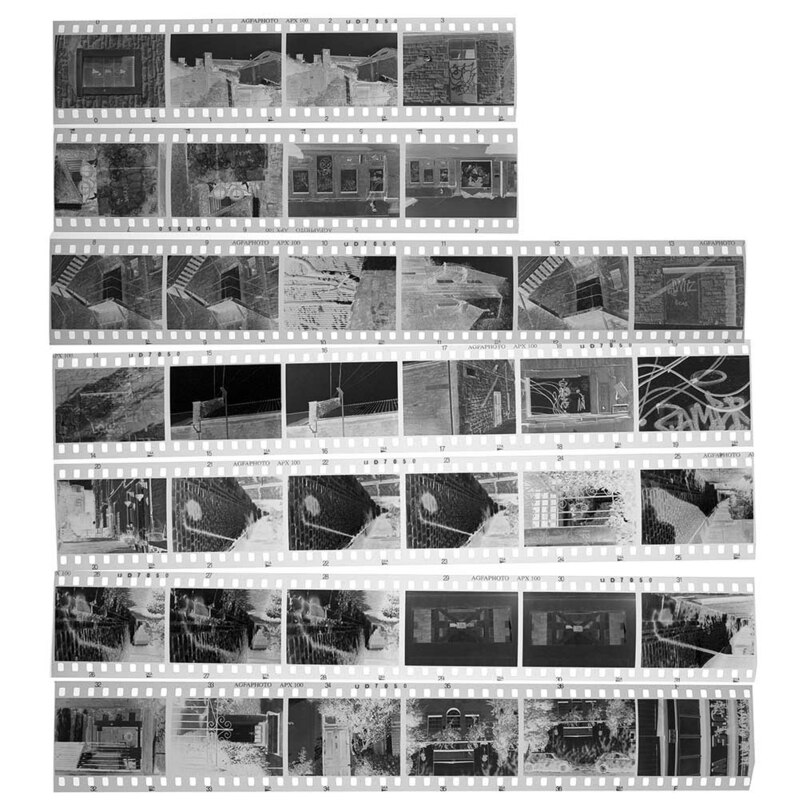 Inside the camera, a roll of 36 exposure Tri-X b/w film, which I would develop myself (so no Photoshop either). I learned to consider each photo, its lighting, its subject all before clicking the shutter. If necessary, I could bracket – taking a 2nd & 3rd photo with varying exposures. Certainly, I did not take 10-20 images of the same subject– one to three had to do. Primitive or perhaps this is a pure form of photography. If you can take a handful of nice photos on one 36 exposure roll, imagine what you can do with a 16gb SD card? The challenge is not really that difficult. Slow down and think about the subject, the lighting and the creative controls you want to leverage to tell your story. Think through various composition angles until you see the one that inspires you. Look for background distractions and check your exposure. Click. One other benefit, I believe, you can achieve by taking this challenge is that it slows your world down. You can gain an appreciation for the world in your viewfinder not rushing from subject to subject. Too many times, I see digital photographers clicking and shooting – then moving on. Not really seeing their world, but simply capturing it in their camera. The 36 Exposure Challenge forces you to slow down and look at your subject, considering the possibilities, before committing it to film or chip. Are you ready to take the challenge? Use a fresh SD card and place a piece of card board over the back screen and keep track of the 36 pictures you take. In the old days, we carried a notebook and made notes on each image (thankfully today we have meta-data for this). And you can use aperture or shutter priority. However, no automatic mode settings!. For the higher level challenge, use manual mode as well. My classes and workshops will begin to include the 36 exposure challenge. If you take the challenge, let me know about your experience with just a digital roll of 36 exposures. Antiques, small shops, galleries, fine dining, bicycling along an old canal and of course, photography are just a few reasons to spend the day at these two small towns linked by a bridge over the Delaware River. We visited Lambertville NJ and New Hope Pa. recently during their annual Shadfest Festival, honoring one of the local Delaware River inhabitants. Consider this small town street photography, with an emphasis on store windows and iconic architecture. This destination is perfect for mobile phone photography or just bring your DSLR with a 35mm prime lens, light to carry quick to use. Store windows offer interesting image opportunities, explore the side streets for picturesqe doors and signage. Even a small doggie in the window. Take a hike or ride your bicycle along the The Delaware and Raritan Canal Trail, especially in with the Fall colors. View images from our recent visit to Lambertville and New Hope during ShadFest 2014.